This year for Halloween we were again gathering at my friends house for her annual Halloween party. The kids got all dressed up, we went trick or treating, then we went back for a great party. Everyone was given something to bring, my job was dessert. I didn't feel like making a cake so I opted this year to make four individual desserts. This chocolate mousse was one of them. All the desserts I made were new, I had never made them before so I was interested in what my friends thought of them. This one got great reviews. The chocolate mousse was creamy and smooth and absolutely delicious. And can I say this is so easy to make, really easy. It has three simple steps, three really simple steps, it sets in about 2 hours and tastes amazing. The recipe doubles easily, so it is great if you need to make a lot. The size of your glasses or jars will determine how many mousses you will get from this recipe, so plan ahead and double the recipe if needed. If you are new to mousse making, give this one a try (Halloween or not) as it is delicious. ​Thanks again Joanne, your Halloween parties are always a lot of fun. In a large bowl add the chocolate and butter. Place the bowl over a saucepan of simmering water (don't allow the water to touch the bowl) and mixing occasionally, allow the chocolate and butter to melt completely. Once melted quickly whisk in the egg yolks, until completely combined. Place the egg whites and cream of tartar in a medium sized bowl. Beat with an electric mixer until it begins to foam up. Slowly add in 2 tablespoons of the sugar, whisking until you get stiff glossy peaks. In another medium sized bowl, add the cream, vanilla extract, and the remaining 2 tablespoons of sugar. Beat with electric beaters until you get stiff peaks. Now place 1/3 of the egg white mixture into the chocolate mixture and gently fold it in to loosen the chocolate mixture. Add the remaining egg white mixture and gently fold in to combine. Add all of the cream mixture to the chocolate mixture and fold in gently until all is combined. 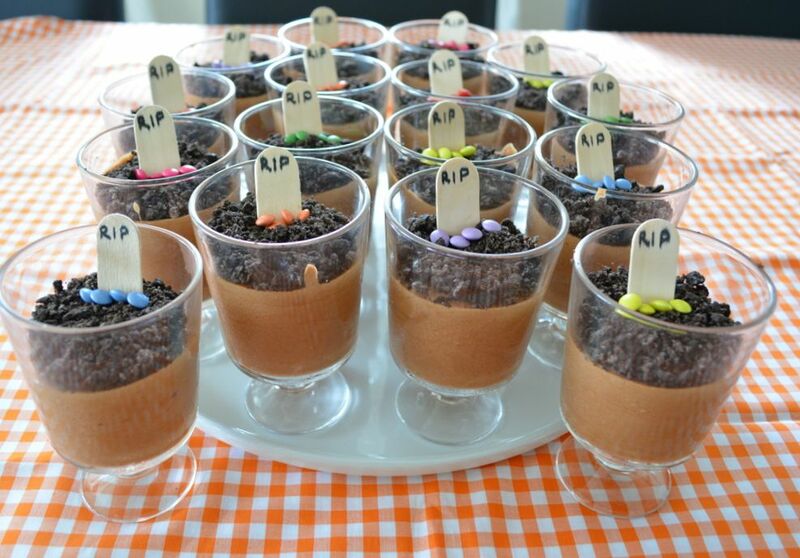 Divide the mousse between your serving glasses and place it in the refrigerator to set for at least 2 hours. Place the oreo biscuits in a food processor and blitz until crumbs are made. Place about 1 tablespoon of oreo crumbs over every mousse. The amount of crumbs needed depends on your glasses. Write RIP on each end of each wooden craft stick. The sticks are long so I cut them in half and use both ends. 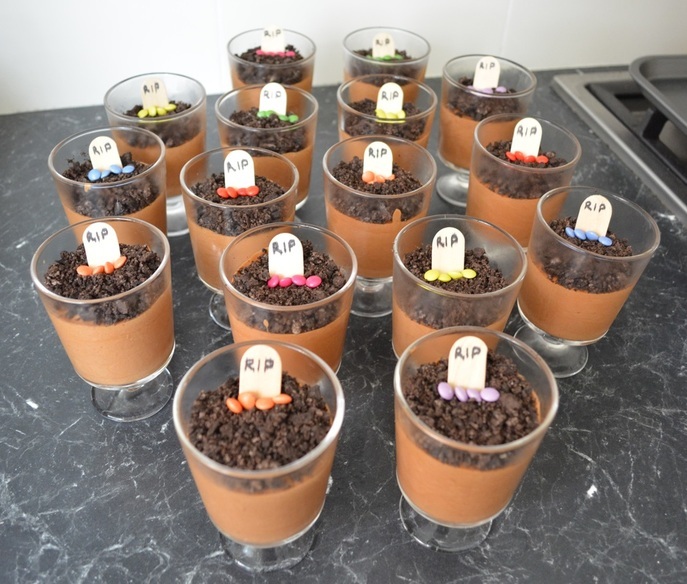 Position into your mousse, decorate with mini m&m's.